In May 2000, heavy rain washed E. coli bacteria into a well providing water to the town of Walkerton. A series of human and mechanical failures allowed the bacteria to get into the municipal water supply. Seven people died and more than 2,300 were ill.
As a result, the Ontario government set up the Walkerton Inquiry under Justice Dennis O’Connor. He issued a two-volume report with 121 recommendations to prevent a similar event from happening again. The Clean Water Act implements some of these recommendations by employing a multi-barrier approach to ensure the safety of drinking water across all municipalities, from source to tap. The first step in the multi barrier approach is protecting the surface water and ground water that supplies Norfolk County’s five water treatment systems. This is called Source Protection, and involves conducting a risk assessments and controlling these threats to our drinking water systems. Click on any of the following questions to read more about each topic. What is the Clean Water Act and how does it fit into source protection? The Clean Water Act, 2006, is part of the Ontario government’s commitment to ensure the sustainability of clean, safe drinking water for all Ontarians and to implement the Walkerton Inquiry recommendations. It establishes the provincial framework for developing local science- based Source Protection Plans for each Source Protection Area in Ontario. Where does Norfolk County source its water from? The communities of Port Dover and Port Rowan/ St. William’s source their water from Lake Erie. Waterford and Simcoe are supplied by groundwater, and the Delhi/Courtland system utilizes a combination of ground water and surface water from Big Creek. Each surface water intake has an Intake Protection Zone (IPZ) that prohibits activities that could contaminate the drinking water source. Similarly, each well-head has a Well Head Protection Area (WHPA) that ensures the groundwater surrounding each well remains contaminant-free. You can look at all areas that are affected by source water protection policies on Norfolk County’s policy mapper. What is a Well Head Protection Area (WHPA) or Intake Protection Zone (IPZ)? Similarly, an Intake Protection Zone (IPZ) is the area around an intake pipe in a lake or river that draws in the surface water where certain activities can negatively impact the drinking water supply. Who protects source water in Norfolk County? Norfolk County covers parts of both the Long Point Region and Grand River watersheds. A watershed is an area of land that catches rain and snow and drains or seeps into a common marsh, stream, river, lake or groundwater. These watersheds, along with Catfish Creek and Kettle creek, make up the Lake Erie Source Protection Region. Norfolk County is one of many stakeholders that sit on the Lake Erie Source Protection Committee which is responsible for identifying and managing current and future threats to drinking water in the region. The committee has developed an official plan through science-based assessments and public consultations to reduce, eliminate, or manage the identified risks. Municipalities like Norfolk County, source protection authorities, local health boards, the province and others are required to implement the policies outlined in the plan, and report on their progress. You can see Long Point Region’s Plan here, and Grand River’s plan here. The committees publicly consult regarding important decisions. Notices will be posted on Norfolk County’s website when public consultation is taking place. Why is it important to protect drinking water sources? We need to protect the sources of our drinking water in order to safeguard the health of our residents and ensure there is enough water for all. Treating drinking water is very costly, and some hazardous chemicals are extremely difficult to remove using conventional drinking water treatment systems. Therefore, the best way to ensure high quality drinking water is to keep source water clean and free of these difficult-to-remove contaminants. How do I know if I’m affected by source water protection policies? If you own property near a municipal well or a surface water intake, you may be affected by a source protection plan. Wellhead Protection Areas (WHPA) around municipal drinking water wells. Visit Norfolk County’s policy mapper tool that shows both zones where source protection policies apply. What are drinking water threats? What about on-site sewage systems (septic tanks)? All properties with on-site sewage systems located within high vulnerable municipal Well Head Protection Areas (WHPAs) or Intake Protection Zone (IPZ) have a greater chance of affecting the municipal water supply well if they are not functioning properly. Check to see if your property falls in a protected area using our policy mapping tool. What can residents do to help protect our source water? Farming practices, household hazardous materials and fuels; snow and road salt use; and over consumption all affect our drinking water. Changes to current processes and habits can help protect our drinking water. All of us – individuals, government, business and industry – have a responsibility to keep our water free from contamination and to protect our drinking water for ourselves and for future generations. Click on any of the following to read more about each topic. If your farm is located within a WHPA or IPZ, you may be required to implement best practices to protect the source water near your farm. Farming operations can have an impact on both surface water sources and groundwater. Fertilizers, pesticides, manure and nutrients can be washed into surface water bodies or leach into groundwater posing a risk to our drinking water sources. See the source protection guide for agricultural land owners published by the Ontario Ministry of Agriculture, Food and Rural Affairs for more information on agricultural best practices. Some common household chemicals and fuels can pose a risk to our drinking water sources if they are not properly stored, used, and disposed. A minor spill or leak of these hazardous compounds can contaminate large volumes of groundwater and surface water. Typically found in paints, adhesives, degreasers, cleaning products (used to dissolve substances such as oils, paint thinners, and glue solvents). Toxic chemicals typically found in paint removers, degreasers, and cleaning products. Diesel, gasoline, home heating fuel, and lubricating oils including used oils. Dispose of fuels, chemicals, or other hazardous wastes at Norfolk County’s household hazardous waste disposal events free of charge. Click here to find out when the next depot event is. Never pour chemicals or hazardous waste down the drain or into storm sewers. Conserving water helps protect the underground reservoirs that our drinking water is extracted from. By following a few simple best practices, we can all do our part to ensure longevity in our water sources. Visit our water conservation guide to find out how you can conserve water every day. Keep your eyes open for the new Drinking Water Protection Zone signs! They are appearing across Ontario to raise awareness about our drinking water sources and to protect our health. The signs are part of Ontario’s Source Water Protection program under the Clean Water Act, which empowers communities to better protect their local water sources. Governments at the provincial and local level are placing signs where a pollution spill could have a significant negative impact on our drinking water. 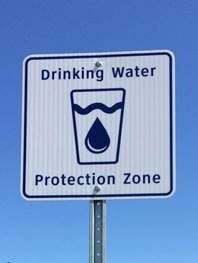 You will see the signs as you drive through a drinking water protection zone. Placement of the signs depends on whether drinking water sources are vulnerable in that area. For further information please contact Source Protection: Jenna Snelgrove, (519) 426-9975.